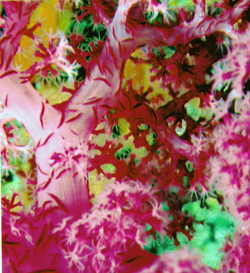 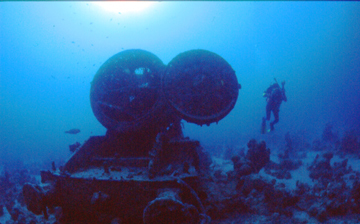 These are some images captured by our underwater photographer Roy Povey during the club's 2004 trip to The Red Sea on the M.V, Snapdragon. 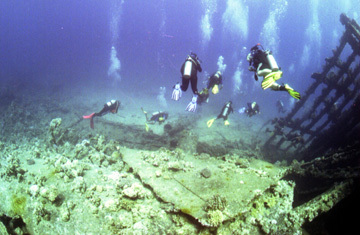 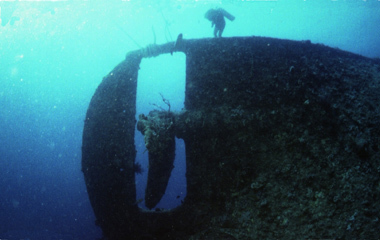 The wreck of the Marcos commonly known as the tile wreck . 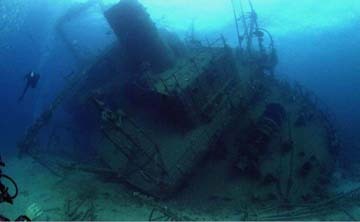 The next wreck we dived on was the Carnatic the fish life on this wreck included queen angel fish and emperor fish depth was 20 metres. 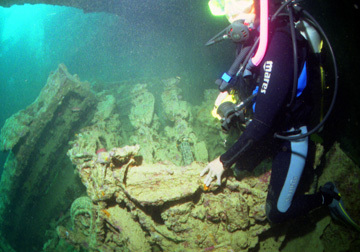 This is the Carnatic taken from the smashed bow section and it is from here that you can swim right inside the wreck if you are interested in gold and who isn't it may be of interest to note that of the ships £40,000 cargo of gold only £32,000 was ever salvaged. 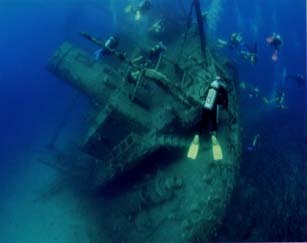 The Ghannis D this is one of my favourite wrecks in the northern red sea it is so photogenic if you look carefully you can see fifteen divers I hung back as the club divers descended to the wreck. 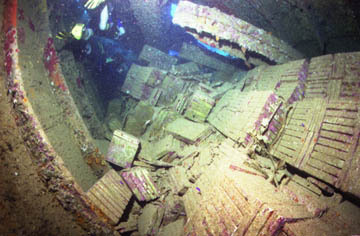 The depth of the wreck was 21 metres. 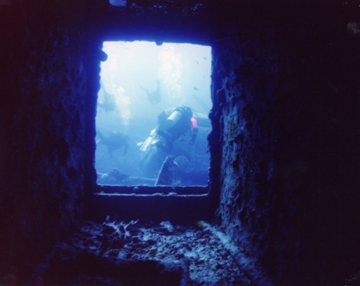 Deep in the engine room of the Ghannis D , to get to the engine room it was necessary to swim through a number of corridors and door ways sorry guys if I held you up while I was taking photos. 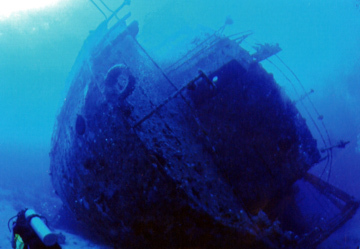 Finally we leave the Ghannis D and head back to the Snapdragon. 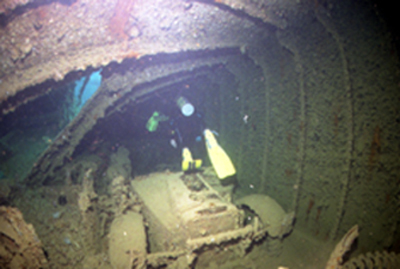 You can still see the rusting BSA motor cycles stacked in the hold. 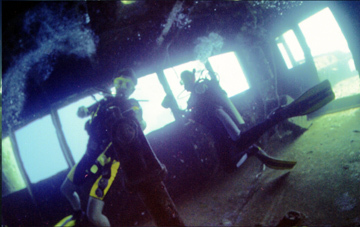 Swimming through the holds we pass some of the trucks and lorries that should have been part of the desert campaign. 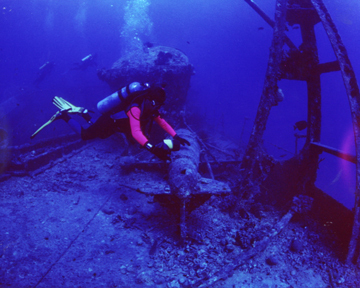 Front hold, swim passed the ladder and into the cabin areas. 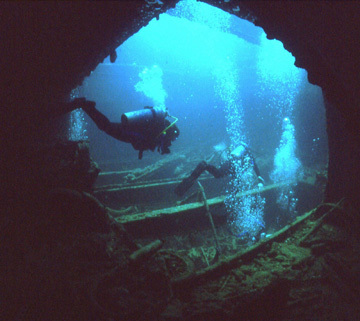 A short swim through the cabin areas and then through a passageway once again you are out on the deck. 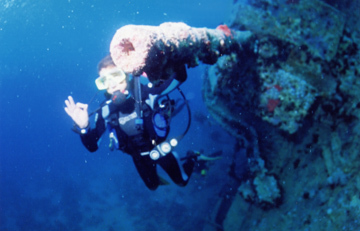 One of the small anti aircraft guns on the Thistlegorm. 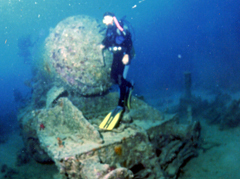 And this is one large naval gun she carried. 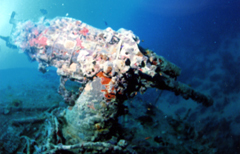 These are not torpedoes they are Para vanes used for clearing mines from the sea bed. 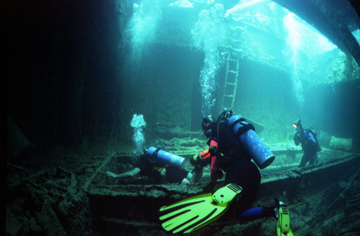 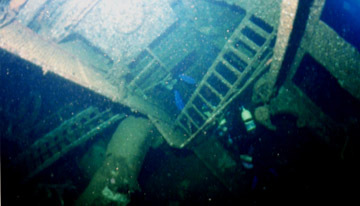 The Thistlegorm was carrying two locomotives both of which fell off the deck of the ship when she sank on this one the front fire door is open. 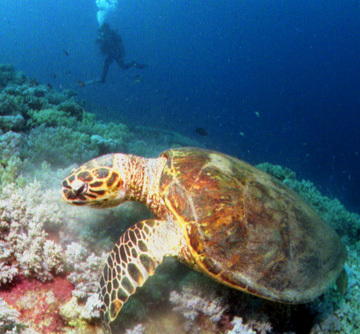 Finally the all important marine life in the Red Sea we spotted this turtle munching its way through the soft coral. 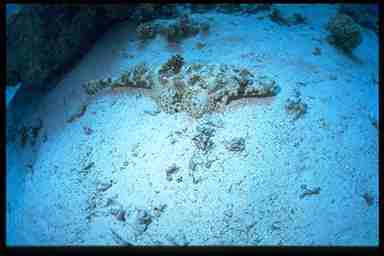 Here a crocodile fish is laying in the sand hoping that his camouflage means we wont spot him if it had not been for colin I would have missed it. 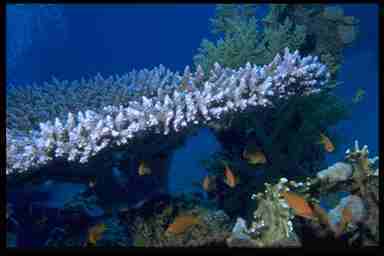 Loads of hard coral and with it the small fish.